Ebru Umar was angry. A Dutch journalist of Turkish heritage, she has been known to take that anger to the page. On the night of April 24, from her summer home in Kusadasi, Turkey, she took it instead to Twitter, raging against a letter the Turkish Embassy in the Netherlands sent to Turkish organizations throughout the country. The message: Please report anyone who has insulted Turkey or its president, Recep Tayyip Erdogan. If possible, include the perpetrator's name, e-mail address, and other identifying information. In tweets laced with profanity, including "#f***ererdogan," Umar decried the edict (which the embassy had later unconvincingly explained was "misinterpreted" as a result of "unfortunate wording"). Even more, she condemned the many Dutch-Turks who supported it. Tweeting late into the night, she cursed Erdogan, cursed his supporters, and battled verbally with Dutch Turks who responded by threatening to turn her in to the police. Then she went to bed. Soon after, a knock at her door signaled that someone had followed through with the threat: Turkish police officers stood outside. Umar spent the night in prison. Though she was released the next day, she may not leave the country. This land arrest could easily end in days, or it could last years. Meantime, as Dutch officials negotiate with the Turkish government to bring her home, she continues writing and condemning the oppression facing her and other journalists. That's not just in Turkey, which now stands 151st in a list of 181 countries ranked for press freedom. "The biggest problem [in Turkey] is freedom of thought, and especially freedom for journalists to engage in political commentary," Turkish Nobel laureate Orhan Pamuk declared last year. Increasingly, Turkish officials are making demands of, and threats against, journalists abroad. The notice from Turkey's embassy to the Netherlands, for instance, followed Germany's decision a month ago to charge comedian Jan Boehmermann for reading an anti-Erdogan poem on his talk show. The poem referred to yet another incident in Germany: the satirical broadcast of a song titled "Erdowie, Erdowo, Erdogan," which included such statements as: "Equal rights for women: beaten up equally." Shortly after the "Erdowie" satire aired, Erdogan demanded it be deleted from the station's web site and wiped from the internet. The TV station refused. But if German broadcasters had defied Turkey's demands, Chancellor Angela Merkel has proved more malleable. There are political reasons for this. As Dutch journalist Jeroen Wollars said on Dutch TV program "De Wereld Draait Door" the day after Umar's arrest, Germany has become completely dependent on Erdogan in the face of the recent agreement over Syrian refugees, which essentially gives the Turkish president the power to stop the wave of refugees to Europe or permit it to continue. Hence, when the Turkish government demanded Boehmermann be prosecuted for insulting its president, Merkel caved. The 35-year-old satirist now faces jail time on the grounds of section 103 of the German penal code, which criminalizes insulting a foreign head of state. "Erdogan has become extremely aggressive since the deal," noted Turkey-based Dutch journalist Lucas Waagmeester on "De Wereld Draaait Door." "And it's not just Erdogan – it's the Turkish soul." In pursuing that aggression, Holland must have seemed like a strategic target. Dutch Turks voted heavily for Erdogan in Turkey's snap election last November, suggesting that they would be sympathetic to his call. But no one had counted on Ebru Umar. Legally, Umar faces the same dilemma confronting Boehmermann: Dutch law also prohibits insulting foreign world leaders. (Though in the shadow of the Boehmermann case, several parliament members have called for repealing the law.) Meantime, pundits on Dutch news and talk shows debate the issue, speaking of the "long arm of Erdogan" and condemning her arrest. But not everyone agrees. The day Umar was released from jail, her Amsterdam apartment was burgled, her old laptop stolen, and the word "whore" scrawled in the hallway. "NederTurks," as Umar calls them – second and third-generation Dutch Turks – continue to threaten her on Twitter, and say in media interviews that she "deserved" to be arrested. She insulted our president, they say. In other words, they view Erdogan as their president, and take conservative Turkish values – not Dutch – as their own. What's more, identifying with Erdogan indicates that they support restricted speech, a more Islamist culture, and have turned against the free secular society in which they were born. "I think your parents, who left house and home to give you a homeland of freedom and security, are proud of you. Your parents who for years have missed their families, have lived and worked in often appalling conditions so that you, their children, could have a better life than they did. Congratulations for your totally failed Dutch-ness. Congratulations for your total loyalty to a pair of mountain goats from Turkey – goatf*ckers, if you will, whom you follow as soon as they call on you to behave like the NSB [a Dutch fascist party active from the 1930s to 1945]. Any idea what the NSB was? Oh, wait, no – the lessons in school about WWII have been scrapped, right? Yes, thanks." Dutch officials have begun voicing concern about Ebru's safety if she does return to The Netherlands. Even so, she has refused police protection. A similar reaction by another outspoken writer, Theo van Gogh (whose column she took over after his 2004 murder by a Muslim radical), proved fatal. Meantime, what the Dutch are calling the "long arm of Erdogan" continues to extend its grasp. 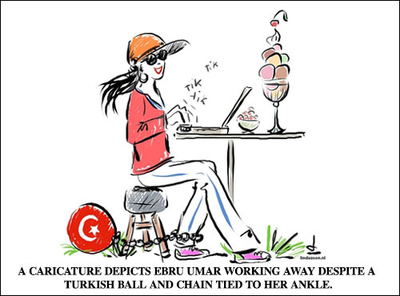 On April 25, as Umar was leaving her prison cell, American freelancer David Lepeska, who has lived in Istanbul for years, returned from a brief holiday in Italy only to be denied re-entry at Istanbul's Ataturk Airport. Instead, the freelancer, who has written for Al Jazeera, Foreign Policy and others, was held for 20 hours before being ushered onto a flight to Chicago without explanation. Contacted by e-mail the following day, he said only, "A bit heartbroken, but determined to return." But even if he is able to go back to Istanbul, what kind of country will he be returning to? In March, authorities seized control of the country's most popular newspaper, Zaman. In August, 2015, two American journalists working for Vice were arrested and charged with terrorism, along with their Turkish associate. Last Thursday, two editors from Turkish daily Cumhurriyet were sentenced to two years in prison on blasphemy charges for reprinting the Charlie Hebdo Mohammed cartoons. For all its exotic charms and celebrated cultural riches, Turkey is fast becoming a land where no journalist, no matter where he or she may come from, can be safe. At first glance you would never think these two would mesh. They are however cut from the same cloth and without great detail Control is only one of many factors. Don't forget I don't want to be hunted down by some goon squad. The comment to be made the symbol and hope of the World for Free Speech and Expression as a G-d Given Right Enshrined in the Bill of Rights and the Caliph hopeful who would impress upon ALL Persons tenants of Sharia retaining for a few the Right to dare speak within certain parameters; find more common ground with each others views than the rest of the Free World.